The DESSIN ESS Evaluation Framework is a structured approach to measuring changes in ecosystem services (ESS). The main purpose of running an evaluation using this framework is to facilitate the application of the ESS Approach in the appraisal of the effects of innovative solutions on freshwater ecosystems and their services. The framework consists of the DESSIN Cookbook (this document), the Companion Document, a Supplementary Material File and a Case Reporting Template. 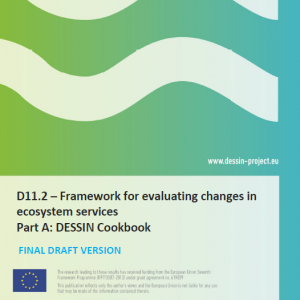 The DESSIN Cookbook presents the practical steps that the user should follow to apply the DESSIN ESS Evaluation Framework. It is intended as a practical guidance for running the evaluations and thus does not include elaborate descriptions of the concepts used (these are found in the Companion Document). The cookbook guides the user through the 5 Parts of the evaluation framework, detailing and exemplifying the practical steps to follow in the application of the framework.